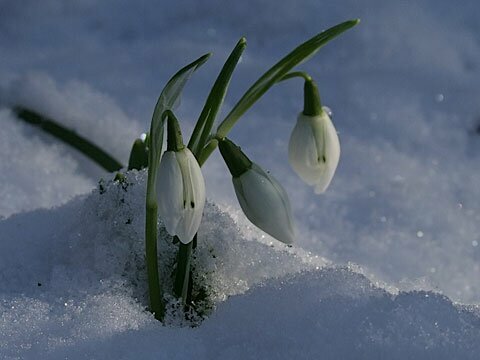 There is no flower that heralds the promise of spring more than the humble snowdrop. Each year, I divide some, replant them thinly and spread the rest out elsewhere. 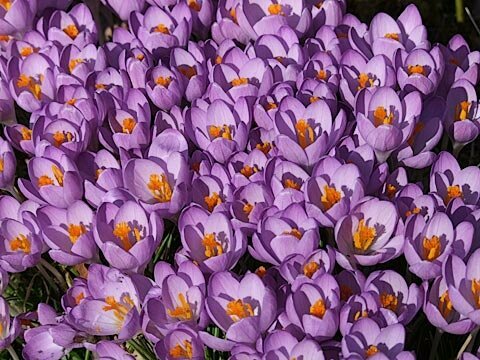 This ensures more flowers as, like most bulbs, they flower less well when crowded; there is not enough food and light to replenish the stores which were depleted by flowering. In theory, they should be divided when the leaves start to wither but I have done so successfully when the leaves first show in early winter. 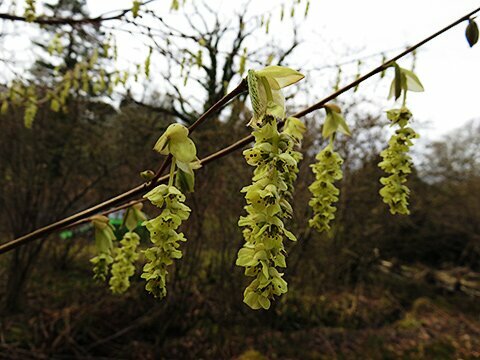 Corylopsis wilmottiae is a dainty small tree with pendant yellow flowers which precede the leaves. One of the Crocus tommasinianus varieties, probably "Whitewell Purple". It is possible to grow clumps like this in the short term but they need splitting to allow the corms ample room to produce enough stores for future flowers. Or replacing as the bulbs are cheap. Too shallow planting (less than 5cm) can cause the corms to divide resulting in few flowers. 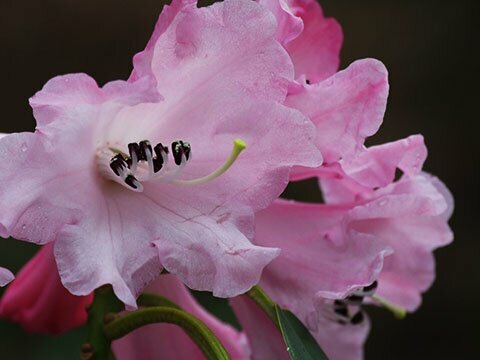 Rhododendron oreodoxa makes a small tree and is one of the earliest to flower. The flowers are fairly frost-resistant. 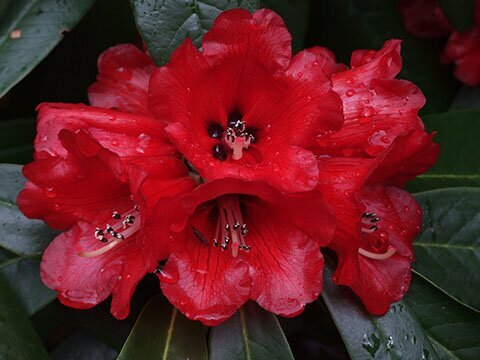 Rhododendron "Choremia" is a striking early hybrid with very good foliage and lots of dark red flowers with blackish nectar pouches. Not for very cold gardens. 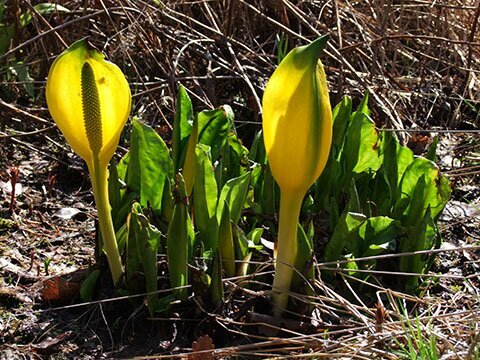 Skunk cabbage is a striking but invasive plant of boggy areas though, for many years, there was little spread. The seeds are easily spread by water. Control by glyphosate works though more than one application is needed. Digging them up is not easy as the roots are long and tough. Hellebores have been a great success and will flower from February through till May. 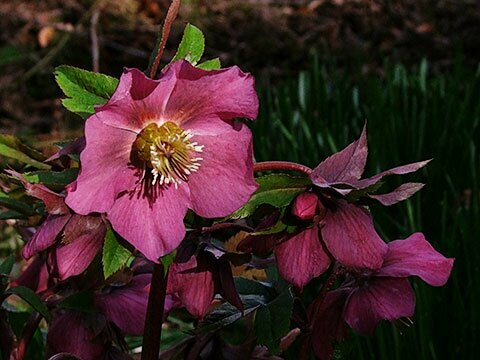 This one is the Lenten Rose but the Corsican and Stinking Hellebores are also worth growing. They tolerate shade and are fine in an open spot. Self-sown seedlings are transplanted to new positions. Colours vary but all look good. "Tete a Tete" is one of the first narcissi to flower here. 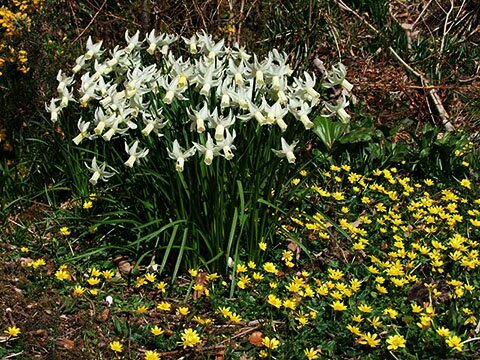 It produces several short flower stems from each bulb and is quite weather-resistant. Narcissus "Jenny" is one of my favourites and here it grows with a ground cover of native Lesser Celandine (cuts down on weeding and looks good). Narcissi belonging to the Cyclamineus group perform really well here whereas Jonquils produce few flowers though they grow ok - perhaps their narrow leaves require a well-spaced open position in good soil to produce enough stores for the bulbs to flower. 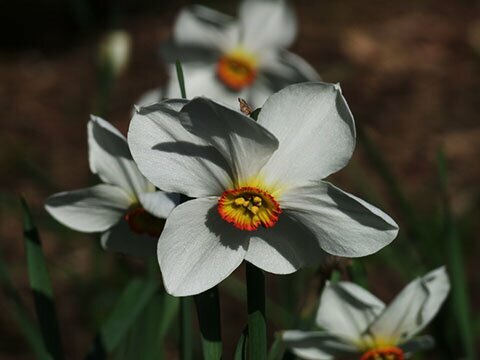 Narcissus "Actaea" is an early-flowering, highly fragrant Pheasant's Eye narcissus. It does need splitting after a few years or the number of flowers will drop, unlike the Cyclamineus types which tolerate a bit of crowding. Lovely for cutting and fills the room with fragrance. Spring. After what is usually a long, wet winter, it is cheering to see the first flowers of the year. 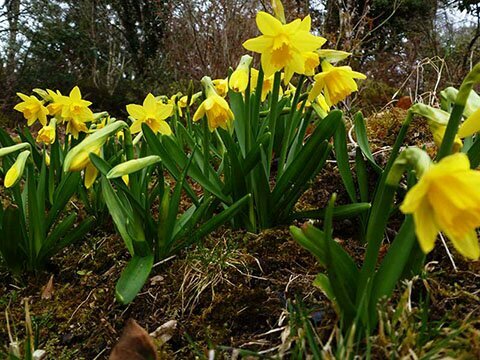 In Ireland spring traditionally starts on 1 February, St Brigid's Day and I think of spring in terms of flowers rather than dates (March to May). There is still much winter weather to endure before it truly feels spring-like. Snowdrops are the first bulbs to flower and there are plenty in the garden.